Summer 1862. A young Confederate cavalryman rides into Kentucky with a set of verbal orders from the former vice president of the United States, General John C. Breckinridge. Cavalryman Adam Johnson's orders are to recruit a Confederate regiment from Union-held western Kentucky. After a series of surprise nocturnal strikes and opportunistic military occupations, Johnson's recuits begin coming in. But there's a problem - many of them are poorly armed. In an unprecedented gamble to arm his burgeoning regiment, he leads 27 hardscrabble Kentucky rebels on the first Confederate raid north of the Mason-Dixon Line in the American Civil War. The raid on Newburgh, Indiana, is underway. 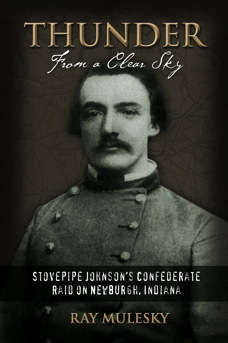 Vivid, thorough, and painstakingly researched, Thunder from a Clear Sky documents five critical weeks of 1862 Civil War history and shares the untold tale of one man's immeasurable impact on a nation at war. Thunder from a Clear Sky was published to a surprising reaction in June 2005. Thousands of copies later, the publisher, after a six-month makeover, has re-launched Thunder to a wider audience. Did I mention it had a better picture of me on the back cover?? Its worth the price for this alone!